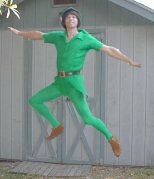 The home page of Peter Pan created by: Randy Constan is, well, a train wreck that just won't stop. I tried to find a quote that would sum up his page, but this web site DEFIES description… well at least in any succinct way. Anyway, check it out BUT be warned you will be amazed (but not in a good way). Especially on the photos page that keeps going and going… when all the while you're thinking no one person could possibly have ever worn so many bad outfits — let alone make a web site about it.